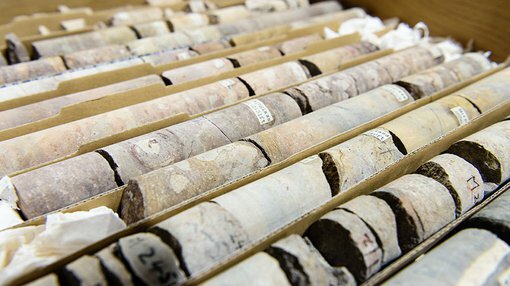 ASX gold junior, Stonewall Resources (ASX:SWJ) today updated the market with results from preliminary metallurgical testwork on reverse circulation (RC) drill samples from its Theta Hill prospect in South Africa. The Theta Hill prospect is part of SWJ’s TGME Gold Project, which is situated next to the historical gold mining town of Pilgrim’s Rest in Mpumalanga Province, some 370 kilometres east of Johannesburg by road or 95 kilometres north of Nelspruit (the capital city of Mpumalanga Province). Tests show an average recovery from bottle‐roll cyanidation tests of 94.9 per cent from eight samples. Additionally, there was an average of 95.7 per cent recovery from Beta Reef (two samples) and 94.7 per cent recovery from Lower Theta Reef (six samples). 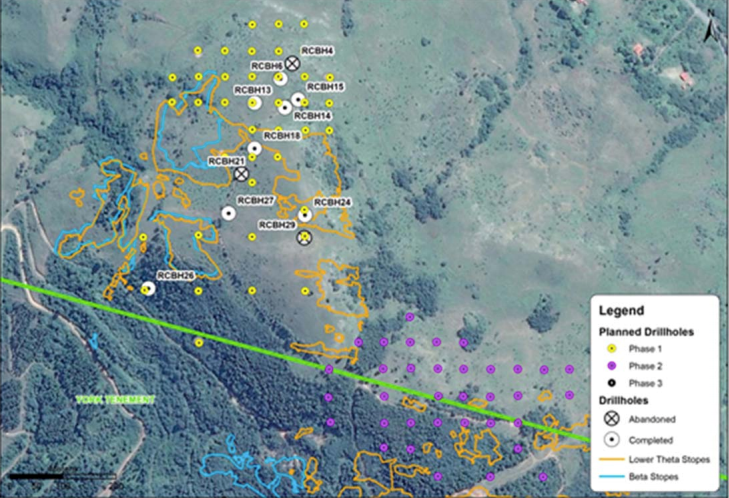 These preliminary results, combined with the recent discovery of high-grade, potential open‐cut gold reef at both Theta Hill and Columbia Hill, supports the plan for near‐term gold production. 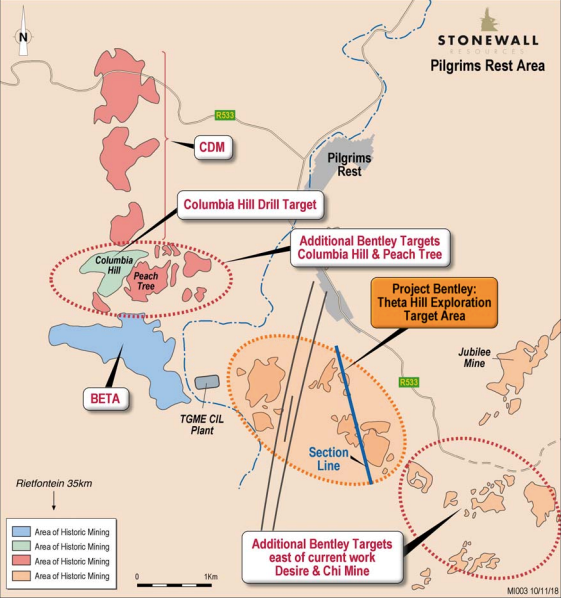 Stonewall managing director, Rob Thomson said: “These preliminary metallurgical tests from the recent RC drilling campaign at Theta Hill show excellent recoveries for conventional milling with cyanide extraction, and fit with our plans to recommence gold production using the existing CIL plant fed with high grade, oxidised ore.
“We are very encouraged by both the high-grade drill results to date, and this early testwork, and look forward to continued drilling and establishment of reserves in 2018, along with expanding our resource base as new discoveries continue to be made,” Thomson said. The direct cyanidation tests were carried out by the SGS laboratory at Barberton, South Africa, from samples collected in the drilling campaign conducted at Theta Hill in December last year. These tests have been designed to test likely amenability of ores to gold extraction via a conventional cyanide leaching circuit, similar to that owned by SWJ at TGME. As part of the exploration campaign planned (Phase 2) at Theta Hill and Columbia Hill, further drilling with RC and diamond methods will be undertaken, along with further metallurgical analysis as part of plans to declare maiden reserves in 2018. SWJ’s current focus is to delineate a high-grade oxide resource, in close proximity to the existing CIL plant, for an early low‐capital start‐up option — with most of the capital expected to be invested into plant refurbishment. SWJ has also announced that it has received commitments for the placement of 119,963,682 shares (subject to rounding) at $0.019 per share and 119,963,682 free attaching listed options (subject to rounding) to raise A$2,279,310. The options will be of the same class as the existing listed option, and will be exercisable at $0.03 each on or before 31 October 2020. This placement is being made under the shortfall offer pursuant to the share purchase plan prospectus, dated 2 November 2017. Funds raised will be used to advance SWJ’s core gold project in South Africa, administration and corporate costs and working capital. The directors reserve the right to place the balance ($3.8 million) of the shortfall from the SPP offer by 6 March 2018 (within three months of the SPP closing date).